50%OFFSALE *** MissManeater AZTEC thin strap sliding super low boutique bikini pant *** BRAZILIAN micro cut! This MissManeater *** LIMITED edition boutique bikini collection is nearly SOLD OUT! But we have a few SUPER special pieces left! This collection has a piece of our heart, as we have hand TYE-DYED this lining in PINK + BLUE! As well as dying the LACE in aqua blue! All of our MissManeater boutique bikinis & designer swimsuits are HAND-MADE with LOVE. But we have taken this collection NEXT LEVEL! This set would usually retail @ $85.00....but we have it on SALE @ 50% OFF!!! So GET IN QUICK! You are guaranteed to have a piece of #maneater HISTORY with these LIMITED EDITION pieces! Check out our FIT GUIDE for your sizing, or feel free to ASK US more! Please see our FIT GUIDE in each styles photo reference images. Any further questions please do not hesitate to ask! 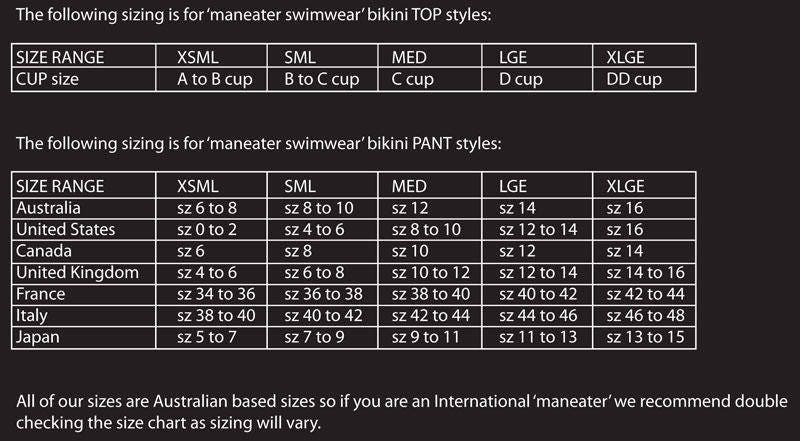 Please ALWAYS treat your MissManeater designer swimsuits + boutique bikinis with LOVE! Always best to hand wash separately! We are more than happy to gift wrap for your SUPER special #maneater! Ask us how! Please note all sales on MissManeater designer swimsuits + boutique bikinis in our SALE section are all FINAL. No returns will be accepted.